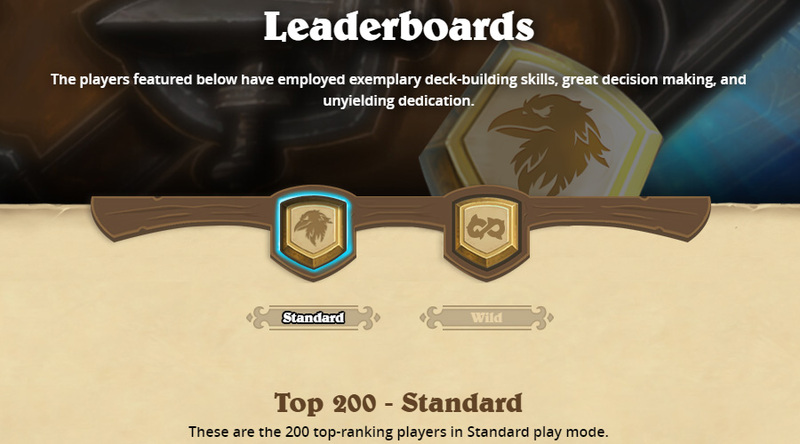 A new feature popped up on the official Hearthstone site after this week's patch - live legend leaderboards! We're not certain the exact delay but it's certainly interesting to be able to keep track of where people are at. The leaderboards are available for the Americas, Europe, and Asia-Pacific regions for both Standard and Wild. They list the top 200 players in each region and mode. So Blizzard, when are we going to get the same for Arena, or seeing who the top brawlers of the week are? That'd be cool. You can check out the leaderboards by clicking here or the image below. or the games played on mobile? That's nice. Next I would like something akin to the WoW armory with users' records and achievements. If everyone’s responses is something to say for why blizzard doesn’t implement features, then it is understandable. They gave you a feature, and you complain about how long it took? Just be greatful that it is there. This is like someone giving your directions after you've arrived at your destination. The point of people wanting this feature before was because it would have been useful for calculating their points for tournament qualification. It actually had a function other than being a simple list. Now it's essentially useless. Also, are you honestly defending Blizzard and blaming their severe lack of content on the community? For those of you are blasting "but where's my XXXX feature?!? ", know that this is a website feature outside of the game itself. It was likely developed by a totally different team than the ones that do in-game featues. Can't wait to celebrate that sweet auto-squelch some time in early 2024. You mean a feature that does nothing new but is litteraly just avoiding you to click once a game? Yeah this is probably their top one priority! There's a plug-in for Hearthstone Deck Tracker that auto-squelches. Yeah, let's celebrate this standard function that has been missing since the start of ranked ladder. Still no in-match chat (idc it's a "design decision") or individual statistics (neither public nor private). This is all fine and good but how many times have I used my hero power in all my games? Hate to be this guy but...tournament mode when? Yes, I have faced some AnduinWrynns impersonators. Typical blizzard style. Adding much requested and/or basic features to the game several years late (still a lot more are missing that is much more needed). This was cute 10-15 years ago but in 2019 this is just unaccaptable. Breaking news by HearthPwn two days late.